This restaurant is permanently closed. Waterfront restaurant with fresh local seafood and cocktails with a tropical flare. Was good food, but wouldn't rate it as stellar. Nice ambiance, good drinks. Wow. Great music and lovely fun and fresh update to Dave's Grill set the stage. The food was unreal - the raw and crudo was excellent. They managed to enhance the lovely fish and let it sing while bringing in seasonal elements that pop (literally like pomegranate seeds). The service was polished and polite. The wine and cocktail list is interesting. Service was a tad slow, but the owner comped my wine, which was a lovely touch. I will be back. It is a perfect balance of fancy Montauk + hipster Montauk. The ribs are amazing and so are the wings. Really fun spot for dinner! Service is great and they are attentive. Good beer menu and nice selection of wines. This is our new favorite restaurant in montauk. Loved the scenic water view. The food was amazing. The jumbo shrimp cocktail was a winner. So was the tuna tartar. For mains I had the sea bass and my husband had the scallops both we would highly recommend. The service was extremely attentive. So happy we found this restaurant! Very creative cocktails which were very good and beautifully presented. Lots of local fish on the menu. Montauk oysters were nice size and fresh. Lobster egg roll very creative and tasty. Relaxed atmosphere right by the docks. Dinner and service were outstanding. The freshness of the specials were evident. We look forward to our next visit. The food was good but the portions for the prices were disappointing. Do not go if you're Hungry! Not Dave's Grill. The apps were good. 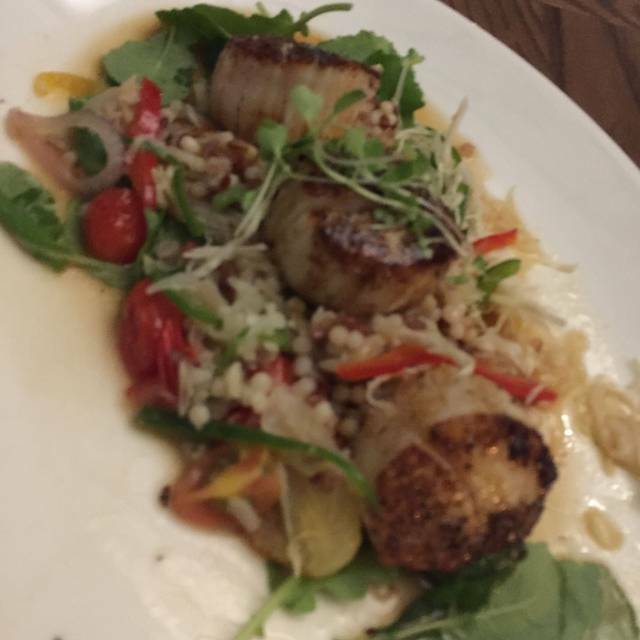 But my scallops entree came out cold. Food was good, portions were average and it was expensive. This restaurant was good. I don't think it was great. A little on the pricey side for what you get. Everything we had was tasty, but not exceptional. Portions were on the small side, so my husband and I shared 3 apps and then each had an entree. Water glasses were kept full, but I can't say that the staff was exceptionally friendly or welcoming. Not bad in any way, but not great. I would recommend it if it were less expensive. For the price, I think it should have been better. Taking over the former Dave's Grill space, we were happy to hear that the owners of one of our favorite restaurants (Bay Kitchen) had taken over. 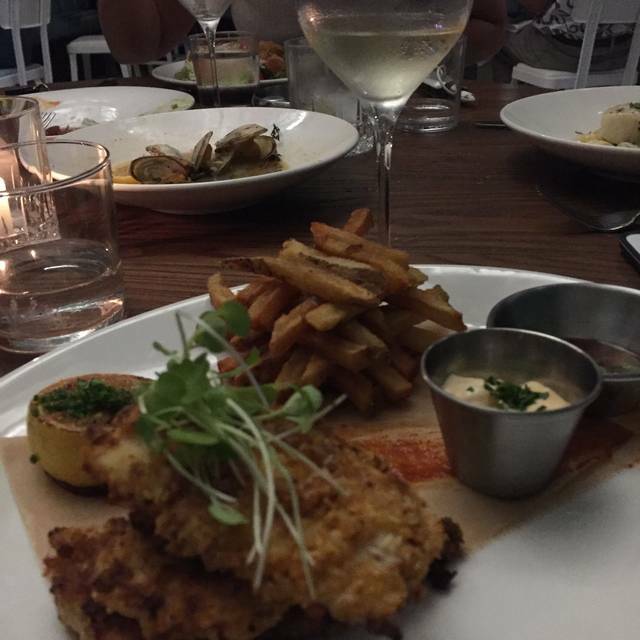 We were not disappointed at Flagship, in particular the food was amazing. Favorites at the table were soft-shell crabs, steamers, Montauk Fluke and Yellow-fin Tuna. Although our waiter was not as attentive as we might like, the restaurant has been beautifully renovated with a patio overlooking the harbor, with Palm Tree wallpaper and sky-blue banquets giving a Caribbean vibe. We had a reservation for 6 on a Thursday night in late August, and we called ahead to see if they could increase it to 8 and they were very gracious about it. We arrived on time and were seated promptly. Born and raised in Long Island, and a cook of shellfish myself, I have to rave, these were some of the best soft shell crabs (tempura fried with an awesome spicy dipping sauce) and steamers (traditionally prepared but not sandy or too large, in a yummy salty broth) that I have ever had. My brother raved that his fluke was "the best fish I ever had." There is a small bar that was lively for a Thursday night, and the restaurant is on the Pier, with ample parking and close to Ben & Jerry's which makes for a complete night. Although the restaurant certainly qualifies as "fine dining" there is no dress code, with other patrons wearing cutoff jean shorts and flipflops, and another having their small dog next to them on the banquet. I am not sure if this is a good thing or a bad thing, I personally don't enjoy seeing other people's toes and dogs when enjoying my $36 entree, but hey this is Montauk so I should relax (which I did)! P.S. this place is a very good value, relative to other places in the Hampton's that do not deliver this outstanding a meal. My teenage kids and I decided to try out the new restaurant. It's an open air restaurant with pleasant decor. The Montauk fluke was some of the best I've ever had. My daughter had the calamari for dinner. Even though they didn't have marinara sauce, she said it was seasoned so well that it didn't need. And my 15year old son had the burger with bacon and fried egg. He said it was in the top 2 burgers he's had in his whole life!! They split the peach tart and flourless chocolate cake. Both were good but not Earth shattering. All in all, worth trying if you're out in Montauk. The food was disappointing. The entrees we ordered (panko crusted tuna and scallops) were both tasteless and left a lot to be desired. For the price, you can go to Crow's Nest or South Edison for a much more memorable meal. I will say the craft cocktails were fantastic though. I would return for a drink only. Our dinner was one of the best in Montauk. We ordered the Fluke and The Chicken, both delicious. The specials were squash blossoms that were amazing. Cocktails are special and tasty. Overall amazing experience and we will definitley come back! Had a lovely date night out here. 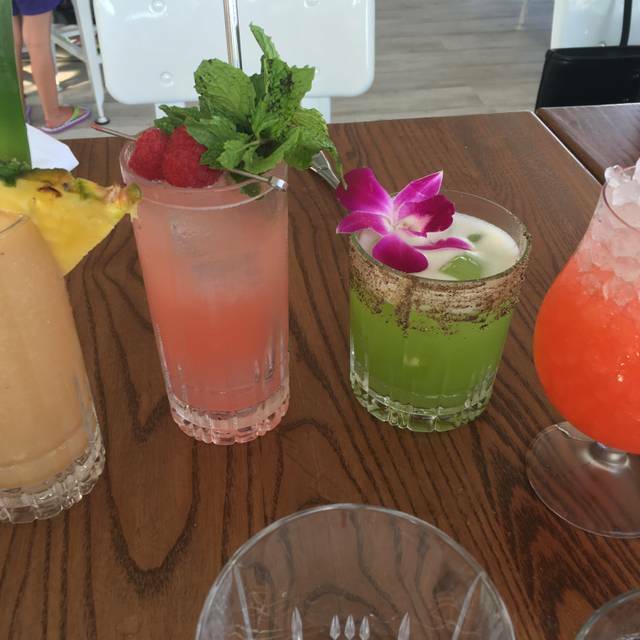 Delicious and incredibly creative cocktails, nice island themed decor, good vibes and great food! I had the veggies over rice and my bf had the halibut special, of which he ate every last bite. Wish we had room for dessert. Happy for the Millers on another Hamptons success! Amazing spot, great owner/staff/chef. Get there!! We enjoyed our dinner staff was very attentive! Our appitizers and main course were delicious and nicely presented. I loved this place! Good food nice atmosphere, slightly noisy but tolerable. The shrimp rolls were delicious & the drinks were creative. Check it out. Don't think you'll regret it. Prices comparable for the area. This place was recommended to us by a friend who previously dined here. 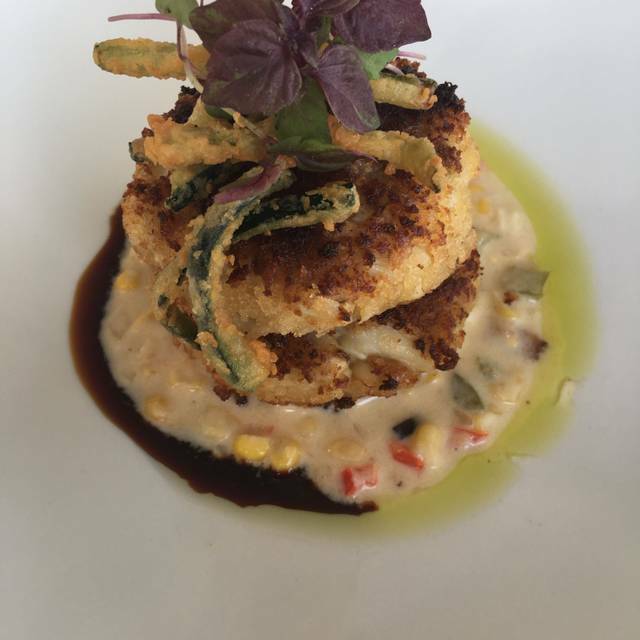 The restaurant itself is a gem in montauk; the ambiance and service were excellent. 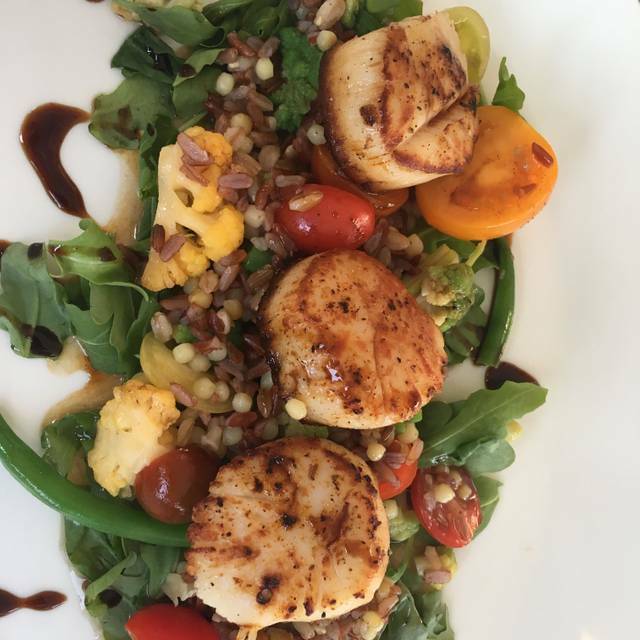 The menu reflected the season and was comprised of fresh ingredients. 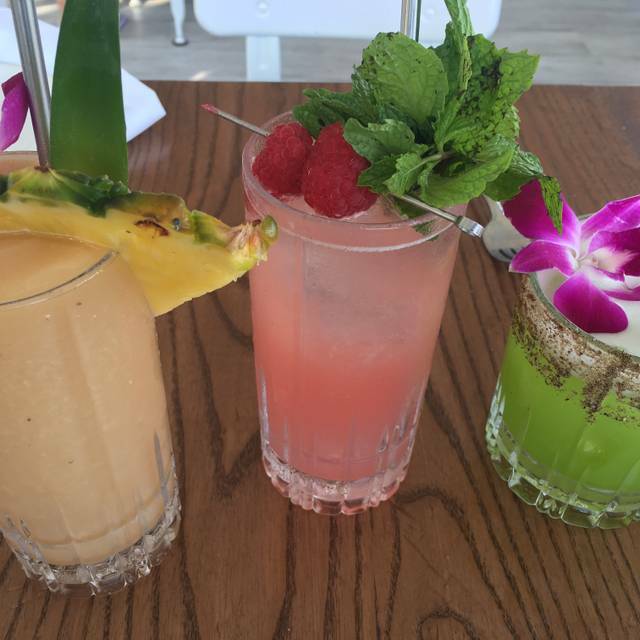 Drinks were very pretty to look at and tastes great. The only downside was that prices were very high and the portions were pretty small. However, I would recommend this restaurant if cost isn't an issue! I had a 9pm reservation at Flagship on a Friday night. We arrived 20 minutes early and the hostesses told us they were running on time and that we could wait at the bar. We waited only ten minutes for our table and enjoyed a delicious cocktail and met some really lovely regulars at the bar in the meantime. The bulk of the seating is "outdoors" - under a roof with open sides that can be closed during bad weather. It was a beautiful night and we were seated near the window and could hear live music from a nearby restaurant. The restaurant is beautifully decorated and the scene was lively, but not loud or clubby for how late it was on a Friday. We ordered a salad, smoked salmon appetizer, fluke frites, and monkfish with proscuitto special for dinner - the food did not disappoint, but the cocktails were the real star. Each one was beautifully presented and different. After dinner we moved inside to the bar and had another drink and talked to the bartenders, Michael and Annie, both of whom were incredibly nice and knowledgeable. I would absolutely recommend and hope to be back the next time we are in Montauk. My sincere thanks to the staff and complements to the chef. We enjoyed the experience! Excellent, everything was delicious. The service was superb. Food was mediocre at best. The quality was there, but the flavor was non-existent in almost every dish we ate. Stick to Bay Kitchen Bar. Very disappointing dinner. Dinner was just average but quite expensive. Worst part was servers whisked your plate away while your last forkful was still in your mouth with each course. Ruined the meal! We really enjoyed Flagship! The restaurant is really pretty and sitting outside is always a plus! The food was delicious, all except for the tuna tartare. (Had no flavor at all.) Steamers and soft shells and fluke were incredible though! I am so afraid to let the cat out of the bag BUT we need the gem to thrive and survive. Everything was great and we left satisfied and surprised at how good it was. 1) Drink at the bar. These guys got creative molecular drink making down to an art. Top notch. The wives LOVED their drink. Now more importantly, they had an excellent selection of top shelf that (wow!) included Rip Van Winkle & Van Winkle, 2 of the premium, hard-to-find bourbons. Kudos for sure! Bartender was friendly, informative and great at the display of drink-making. 2) Ah the food. From the amazing steamers app (extra bread please) which were top 5 level steamers to the mixed salad (yes, even that was perfectly balanced with a light vinaigrette), every bite was excellent. Main courses around the table ranged from a perfectly grilled steak with mushroom/onion side (shocked how good this was), local fluke beautifully cooked and presented to what my wife & shared: crab cake app and salmon special. Every bite of this entire meal was really top notch (not cheap, make no mistake). The service was warm, friendly and attentive. Next time out next week, we're going again for sure. Absolute recommend!!! STAY AWAY - All our meals were awful - food was so poorly prepared - please dont waste your time! The quality of ingredients are terrible too. I would not recommend this place at all, I have been going to Dave's (which was previously there for years), and this is such a down grade. The food was so so, the chef arrogantly said he would shell my lobster just this one time. The food was way over priced for the size portions we got. The table set up was very poorly laid out. No reason to ever go here versus the dozens of other restaurants on the water. Bad menu, bad service, I give them one year before they go out of business. Had a very nice time. Food was very good. The only strange thing was when they first seat you and put bread on your table they put two pieces. Why bother it's a bit odd, you are better off ask asking people if they want bread if you don't want to waste otherwise at least put four pieces for two people. I have to say it's a small complaint but it was noted, the rest of the evening was very nice. Pretty good! Hate to share this as place is small and once word gets out it will be difficult to get a table. Food was excellent. Service attentive. Ambiance just OK but drinks, which we only saw as our party only had beer, looked spectacular. Thought I'd miss Daves which used to house this new addition to the Montauk scene but Flagship goes one better with great creative food. Imaginative cocktails are terrific too. Only downside of course is how high your bill is in the end. But being in "The End", one has to expect to pay premium prices for a summer dining experience. What a great new "Find" in Montauk. Delicious and great owner. We were seated and waited 20 minutes before anyone looked our way. Then they asked what kind of water we wanted, I asked if we could please order a drink from the bar. The waitress then came back for our order, I said could we get our drink first. We then waited another 10 minutes before the drinks arrived. The waitress then took our dinner order and after we ordered she then told us about the specials. Very sad because the food is really good. There were only two waitresses and two young girls wandering around just to pour water and remove plates. If you asked them for something they had to go find the waitress. atmosphere was good service was wonderful and food was excellent.... Good luck @ your new location.